I made an old standby for today, Apple Crisp for Retro Recipe Saturday. I was gone most of last week, so I was trying to find an easy recipe for today. This is a friend's family recipe that was passed down from her mom to her and then to the next generation which is where I fit. I think this recipe is at least 70 years old, if not older. They were from Leadville, Colorado and raised sheep, so this is one of those recipes that a city girl like me, fell in love with. It is a basic, homey recipe that is great for the fall. Especially with the plethora of fresh apples available right now. So now, today's recipe Apple Crisp for Retro Recipe Saturday. Have fun cooking. Preheat oven to 350 degrees and spray a nonstick spray in a 9 x 13 inch pan. Put your peeled, cored, and sliced apples into a large bowl. Add sugar, cinnamon, nutmeg, and cornstarch and mix well, so that apples are well coated. Spread in the bottom of your casserole dish. Set aside. In another bowl add your softened butter, oats, sugar, flour, cinnamon, nutmeg, and mix well. Put on top of your apple mixture. I do it with my hands, and drop it on as evenly as possible. I normally put it up to about a 1/2 inch from the edge of the pan. I am not precise. It is a pretty rustic dessert. This can be served hot or cold, and it can be served immediately or later when you are ready. I hope that you like this recipe. It seemed fitting for fall. I would love to hear any comments that you have. That's a reminder! But we call it Apple Crumble over here, and I don't usually use honey and/or cornstarch. Can see the sense of doing so, though, and the next time I've more than one to cook for will think about doing it! Thanks for sharing! This looks amazing and something I think my husband would love thanks for sharing..
Erica, your newest follower through make my Saturday sweet! Mmm....apple crisp is SO good! Can't wait to try it. Thanks for sharing at Mom's Library! 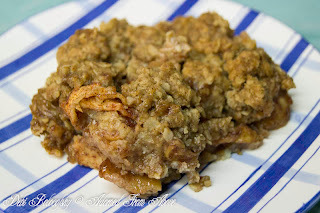 I always make apple crisp whenever I have apples that are getting a bit soft. Your recipe is very similar to mine. Although no cornstarch. I'll have to try yours sometime. Always fun to try a different variety. Thanks for sharing with SYC. YUMMMM! Thanks for joining the party at One Creative Weekend! I hope to see you back today.